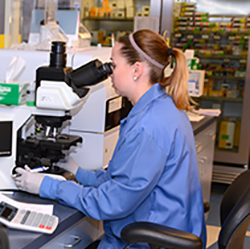 Clarke County Hospital offers a full-service laboratory staffed with highly-trained professionals. Our team has many years of combined experience to provide you with very skilled care every time you visit. You can expect us to work together in a compassionate and caring manner. We will protect your privacy and minimize wait times while providing a comfortable and clean environment. Our laboratory services consist of a full-range of diagnostic and follow-up testing. We have state-of-the-art equipment, enabling us to provide quality care for inpatients, outpatients, local nursing homes, wellness programs, practitioner clinics and the Emergency Department. 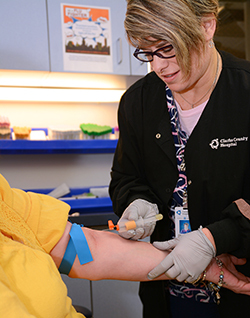 To receive most laboratory testing, patients must present a provider's order. Saturday and Sunday - 8:00 a.m. to 2:00 p.m. There is no need to schedule an appointment, just show up with your signed order, during our outpatient services hours listed. If you would like to schedule an appointment please contact our scheduling department at (641) 342-5353, it would be our pleasure to serve you. We request that outpatients have their routine lab work done Monday through Friday during outpatient hours when the lab is fully staffed. Weekends are staffed with only one technician whose primary responsibility is to take care of hospital and emergency patients.